Eventually the story unfolded into: An officer responding to the 911 call and found John T. Winesickle, who told him he’d found Bigfoot tracks when out for a walk. The officer accompanied Mr. Winesickle to the tracks, and took pictures of them. The 911 call was a request to have an officer confirm the tracks and thus confirm Bigfoot. Mr. Winesickles story and Stan Gordon’s conclusion are paired in a local Pennsylvania Paper, Daily American. Read an excerpt below. PAINT TOWNSHIP — John T. Winesickle is still convinced there’s a Sasquatch in his neck of the woods. 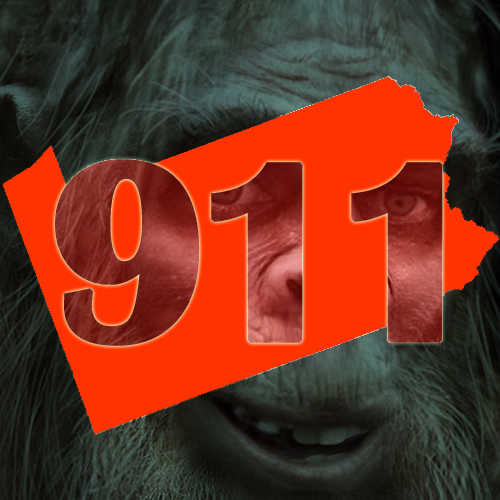 Summarily dismissed by the Pennsylvania Game Commission, Paint Township police and Pennsylvania Bigfoot Society, Winesickle said he remains certain that there are at least two — plural — Bigfoot roaming the state game lands near his home. “He’s a giant,” the Paint Township man said of the male. Though he’s never seen the creatures, Winesickle claims to have heard the Mr. make bassy, guttural sounds. Adamant that his findings are sincere and legitimate, the Paint Township resident doesn’t present himself a charlatan. He isn’t writing any books and has declined offers to buy his original photographs, which depict large, ambiguous footprints in the mud. This entry was posted on Sunday, June 30th, 2013 at 12:00 pm and is filed under Bigfoot, Bigfoot Lunch Club, Sasquatch. You can follow responses via our RSS 2.0 feed. You can skip to the end and leave a response. Pinging is not allowed. The witness admits he has not seen any Bigfoots, only heard them or in reality, he heard what he thought may be a Bigfoot. And from this he deducts there are two of them. And that one is male and rather a giant. In addition, he deducts from unconfirmed sounds that there is also a female that happens to be pregnant. LOL Brilliant! All that from hearing sounds, oh, and a claim of tracks in his possession. A bit of a stretch in the old hypothesis there, eh buddy? I mean, not much of an extrapolation at all. He fermently held to reason, logic and the scientific method–NOT! So, again, I am going to deduct with a more credulous statement that the witnesses testimony is incorrect, funny, but still incorrect. I am not saying that there are not Bigfoots about in his vicinity. What I am saying that deducing two Bigfoots, a giant male and pregnant female from sounds he heard that could have come from any animal, is BS! If I heard a splash in the water and saw a wake, I would not deduct that I know there is an undiscovered sea monster, just feet from the beach in the Chesapeake Bay. Unbelievable! And he wants people to take him seriously? Really? Then quit making up crap from noises you heard. End of story! So he found some prints and heard some noises and came to the conclusion that there are two apes in his woods AND that one of them must be pregnant. Not the most convincing account out there. DUDE! Sell the photos. OK, if you can’t part with the originals, make prints and sell those. Get something out of this, because I don’t think you are getting what you want to get out of this. Offers are people exercising their right to spend their money however they choose. Go for it.